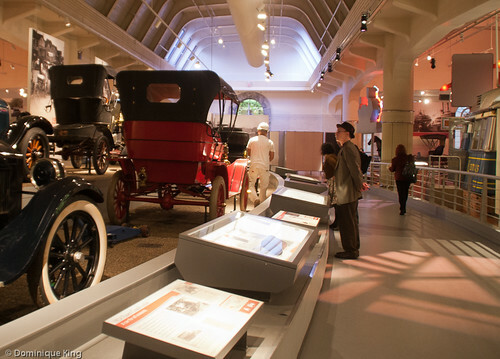 Workers put the finishing touches on "Driving America" at The Henry Ford in Dearborn, Michigan, last week as a reimagining of the museum's premiere auto exhibit for the 21st century approached its public debut, set for Sunday, January 29. Museum visitors familiar with the exhibit's former incarnation as "The Automobile in American Life" should be pleased to see some familiar and favorite artifacts like the 1960s-vintage Golden Arches sign, a 1930s-vintage tourist cabin and a diner car from 1946, interspersed among a vehicle collection spanning automotive history beginning in 1865 with a Roper steam carriage (thought to be the oldest surviving American car) and continuing into the present day to include innovative and alternative vehicles like hybrids and Segways. 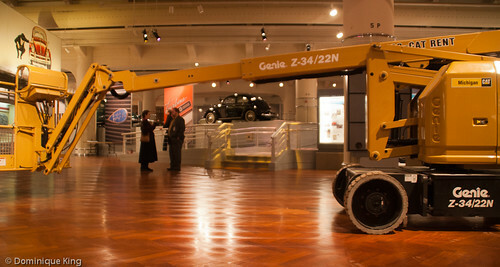 I wrote about the upgrade early last year as workers began dismantling the old exhibit, making repairs and preparing to close the exhibit during the a year-long renovation, so I was especially thrilled when the folks at The Henry Ford invited me for a preview of the redesigned exhibit. While "The Automobile in American Life" represented a real step forward from traditional, static collections of artifacts in terms of interpretive exhibits and using a variety of media to engage viewers at its 1987 opening, "Driving America" represents another leap forward in visitor engagement with sophisticated interactive elements and a new emphasis on the automobile's impact on our culture and everyday life. 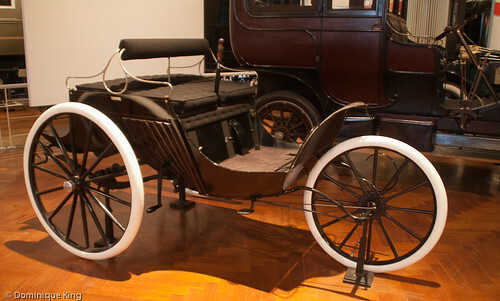 Last year, I wrote that some historians questioned the old exhibit's emphasis on automotive history from the manufacturers' point of view to the near exclusion of that history from the consumers' point of view and slight attention to the idea that the automobile led to a fundamental change in our entire culture over time. I'd like to think that they would appreciate the new exhibit's emphasis on that cultural change and enhanced interactive elements that give visitors more personal ways to relate to museum artifacts. I enjoyed exploring the exhibit with the museum's 18 touchscreen kiosks. 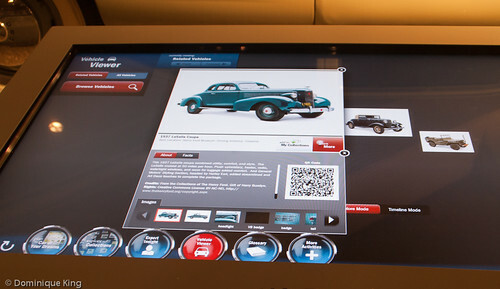 The 42-inch touchscreen stations are a first for The Henry Ford and offer some really cool ways to access museum artifacts on, and off, of the museum floor. Word searches give visitors access to artifacts and related items, while an app-like interface with app-directed interactive features gives visitors some really fun ways to access information. Want a closer look at something? You can pull up a photo and enlarge it with a flick of your fingertips, much as you can enlarge a section of the screen on your smart phone or tablet. I heard several people say they had a lot of fun playing the "Talk like a Trucker" game on one kiosk where viewers tried to guess the correct meaning of phrases commonly used by truckers who used Citizen Band (CB) radios during their 1970s heyday. I hate to admit it, but I did pretty well at this game because I actually had a CB radio during my days cruising Woodward Avenue as "Highway Star" (my CB name or "handle"). I also loved the Car Tunes kiosk, where I listened to audio clips of car-related songs dating from 1900 to the present day. 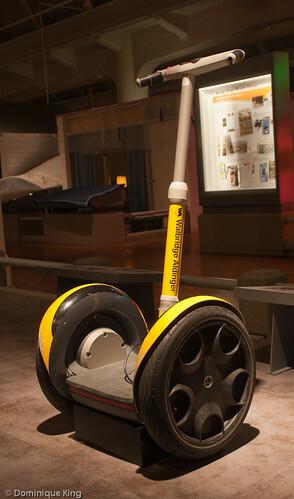 The My Collections feature sounds especially cool, as visitors will use Radio Frequency Identification Cards issued at the exhibit to bookmark favorite items, photos or videos to create a custom collection accessible on their home computer, smartphone or tablet via a special link sent to their email address. That feature wasn't available during the press preview, but I look forward to trying it out next time I visit the exhibit. I'm glad to see many of my old favorite pieces in the exhibit, and I'm especially excited to learn that visitors will now be able to order food at the Lamy Diner. 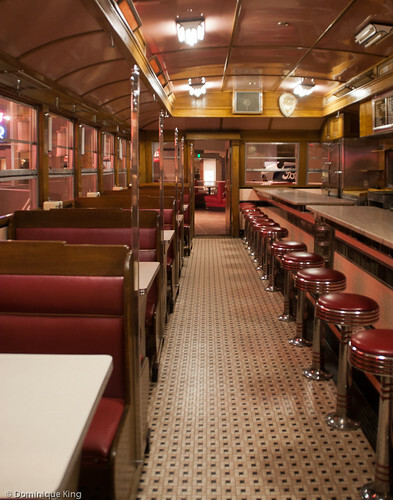 I remember how much fun we had stopping for an ice cream cone at the Blue Moon Diner car in Kalamazoo's Gilmore Car Museum, and I'm thrilled to see we'll be able to enjoy a similar experience much closer to home! 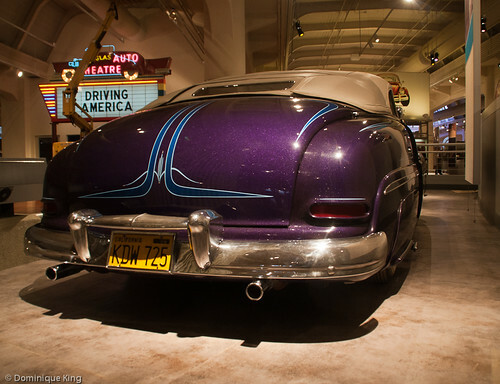 "Driving America" covers 80,000 square feet with 130 vehicles and more than 60 cases of automotive-related artifacts. The new 15-minute film playing at the exhibit's 100-seat theater explores automotive innovation and, in the words of The Henry Ford's senior curator of transportation Bob Casey, the car as our "chariot to the unknown" and agent for expanding our personal freedom.